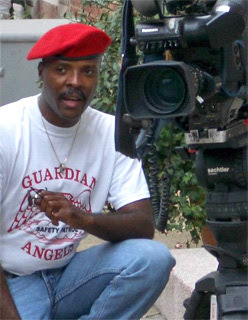 True to form, a Guardian Angel horns in on a video camera. Never ones to let a high profile mugging go to waste, the Guardian Angels have magically reappeared in front of news cameras on the Magnificent Mile today. Hot on the heels of this weekend's one (1) Michigan Avenue iPhone robbery, the Angels have even whipped up a slogan: Don't let the Magnificent Mile become the Muggers’ Mile. Mmmm. Maybe they should send that one back to R & D.
CBS2's report concludes with, "a police spokesperson went on to say there have been only three robberies reported on the Magnificent Mile in the last 28 days." Three in 28 days? We had three in 13 minutes yesterday. Rookies. It all makes us wonder why the Guardian Angels aren't up here in Wrigleyville and Boystown. Oh, that's right. They disappeared after glomming on to the 2011 publicity train.